Do you feel as secure in your resume as you do in the systems you administer? View this sample to learn how to emphasize your strongest IT proficiencies. Do you feel as secure in your resume as you do in the systems you set up and maintain? Well, to be a successful candidate for tech jobs, resume expert Kim Isaacs says it helps to have a comprehensive resume. 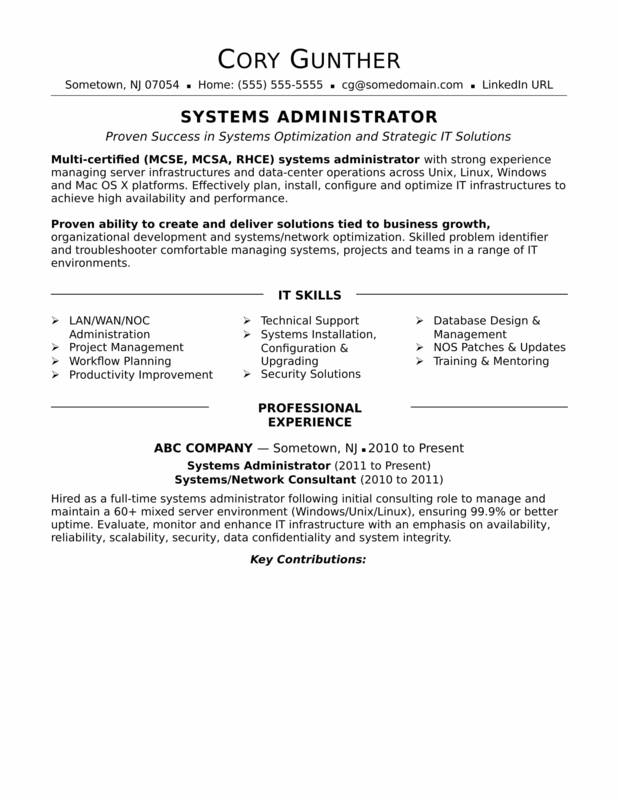 To learn how you can emphasize your strongest IT proficiencies, view this sample resume for an experienced systems administrator that Isaacs created below and download the experienced systems administrator resume template. Jobs for systems admins are projected to grow by 6% (or 24,00 jobs) from 2016 through 2026, according to the Bureau of Labor Statistics (BLS). You'll find the highest level of employment for this job in the following states: California, Texas, New York, Virginia, and Florida; and in the following metropolitan areas: New York City, Washington D.C., Dallas, Los Angeles, and Chicago. As a systems admin, you can expect to earn a median wage of $81,100 per year, or $38.99 per hour, according to the BLS. Additionally, you can learn about technology careers and search for systems administrator jobs on Monster. Multi-certified (MCSE, MCSA, RHCE) systems administrator with strong experience managing server infrastructures and data-center operations across Unix, Linux, Windows and Mac OS X platforms. Effectively plan, install, configure and optimize IT infrastructures to achieve high availability and performance. Proven ability to create and deliver solutions tied to business growth, organizational development and systems/network optimization. Skilled problem identifier and troubleshooter comfortable managing systems, projects and teams in a range of IT environments. Hired as a full-time systems administrator following initial consulting role to manage and maintain a 60+ mixed server environment (Windows/Unix/Linux), ensuring 99.9% or better uptime. Evaluate, monitor and enhance IT infrastructure with an emphasis on availability, reliability, scalability, security, data confidentiality and system integrity. Reengineered company’s systems setup, establishing automated server generation routines, optimizing system performance, installing upgrades/patches, establishing system monitoring and maintaining security protocols. Ensured that all server hardware, operating systems, software and procedures aligned with organizational standards and strategic business plan. Revamped NetBackup schedule and upgraded 15 Oracle servers. Optimized system availability (averaging 99.95% uptime) and equipped company with scalable systems to support business growth. Increased team productivity and automated repetitive tasks by using batch files, PowerShell, VBScript and WMI. Acted as escalation point for troubleshooting advanced network/systems issues; consistently earned 100% issue-resolution scores by providing excellent service to internal and external customers. Trained employees across multiple departments on network operations including log-in procedures, network management software, permissions, printing issues, security and use of software. Consulted with client companies to provide Web-based and network solutions along with strategic planning and project leadership over systems migration, configuration, administration, upgrades and troubleshooting initiatives. Directed the implementation and performance tuning of Windows 2003 Server environment for client’s global operations. Delivered a major improvement over old VPN system that catapulted productivity of remote sales force. Led in-house and consultant team in large-scale Linux server upgrade for multinational consulting firm, which significantly enhanced system performance. Resolved a history of problematic network failure by troubleshooting LAN/WAN connections between multiple stores for a regional retail chain. Drove a 25% decrease in Web site downtime by migrating RaQ4 server sites and online stores to Linux server. Corrected server configuration problems, wrote scripts to ensure smooth server/reboot functioning, and assisted with a variety of Linux-based inquiries and concerns. Replaced major manufacturer’s vulnerable network with robust security through joint architecture of firewall and DHCP. Stabilized, expanded and protected client network and PC environment. Built new file servers to maximize Web hosting, terminal server, file/print sharing and domain control performance. You're used to maintaining complex digital infrastructures, so you might think cobbling together a user-friendly resume is a breeze. In a word: Don't. Could you use some help troubleshooting your resume? Get a free resume evaluation today from the experts at Monster's Resume Writing Service. You'll get detailed feedback in two business days, including a review of your resume's appearance and content, and a prediction of a recruiter's first impression. Think of Monster as the help desk for your career.